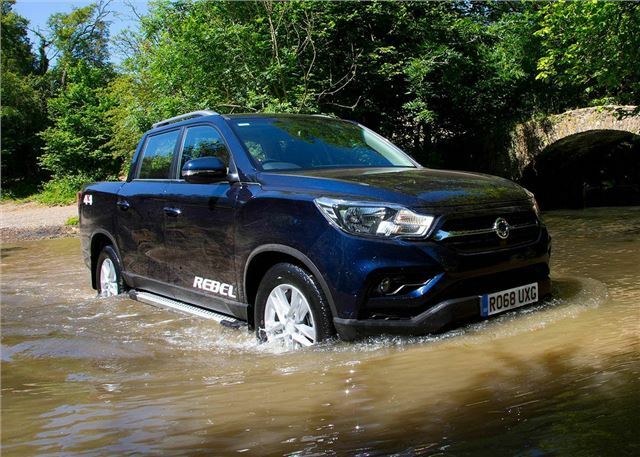 Like many pick-ups on the market, the SsangYong Musso is built on a ladder-frame chassis and designed for hauling heavy loads both on and off-road. The part-time four-wheel drive system can be activated while on the move, with the driver getting the option of both high and low range gearing. There is no differential lock, but a built-in hill descent control system allows the Musso to automatically control its speed down a steep hill or bank. We tested the Musso over a five-mile course up and down steep grassy banks, along ridges, down streams. It does the job as well as any pick-up on sale right now. In its default mode, the vehicle runs in rear-wheel drive to save fuel. The Musso is competent enough on the road, but no match for the refined and SUV-like Nissan Navara. In comparison the steering is vague and there is noticeable levels of body roll in the corners. That said, it is safe and predictable to drive and similar to the Ford Range and Mitsubishi L200 in its handling. It's smooth and comfortable on the motorway too. The Musso uses double wishbone independent suspension at the front and coil springs at the back, which should provide a better ride quality over the traditional leaf springs that are found in the L200 and Ranger. To cope with the payloads and towing weights, the suspension has been made extremely hard and this makes the ride quality poor on rough roads with lots of vibration being transferred to the cabin. Things improve when the load bay is fully laden, but the Musso’s fidgety ride is ever present. The 2.2 turbodiesel is strong and provides a smooth punch of 400Nm torque through all of the gears. The four-cylinder engine is quiet and works exceptionally well with the optional six-speed automatic gearbox, the only blot in the report card is the disappointing fuel economy. Officially, the auto returns 32.8mpg while the six-speed manual is better at 35.8mph, but with a full payload load the Musso will return much less. Driver safety is well catered for, with all getting an active rollover protection system that will automatically and selectively apply the brakes on all four-wheels to prevent the vehicle rolling over in the event of an accident. Front fog lights, heated door mirrors and a full size spare wheel are also fitted as standard to all models.